These are all genuine gemstones. A fine gold chain, with gems along its length, with a 20mm circular pendant at the front, loaded with gemstones. The morganites, are spaced out on the chain, as well as 2 inside the main circle at the front. These are a clear pink, faceted wild cut rectangle shape aprox 5mm x 6mm to 10mm X 7mm in size. 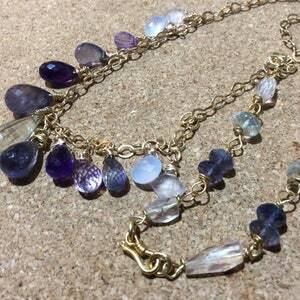 There are a similar shape and size of Iolite, along the chain, and inside the circle as well, with some faceted rondelles of Iolite to match aprox 6mm x 4mm. At the top of the circular pendant are 5 faceted full teardrop briolettes of rainbow moonstone, with blue flashes inside aprox 8mm x 4mm. All around the circle, there are tiny faceted roundelles of blue- flash labradorites, aprox 2mm x 3mm in size, and swinging from the bottoms are 2 x large full faceted teardrops of the same blue- flash labradorite aprox 12mm x 8mm. 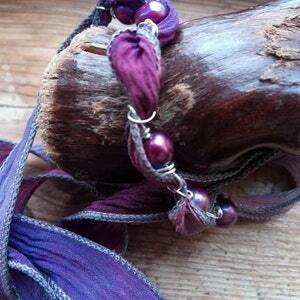 The 2 x moss- Amethyst's are clear to light lilac, with glittering rutiles in deep purple. they are aprox 11mm x 8mm. 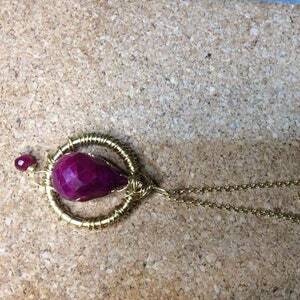 At the moment, this necklace is aprox 20 inches long, and because of its style, it sits where most 17 inch long necklaces would on the neck, but please email me for a different length of chain if you are the winning bidder and this is not long enough. 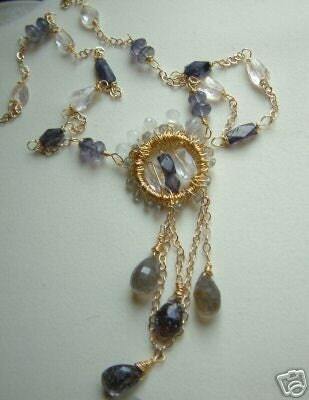 please email if you would prefer a necklace with different gemstones, 9 carat gold or sterling silver instead. 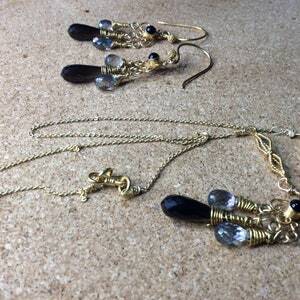 Onyx, smoky topaz, mystic topaz , gold earrings and necklace set. Necklace set. Gemstone set.